Tech News India: Yamaha SZ Tour rounds off in the Heart of God’s Own Country- Kochi! Yamaha SZ Tour rounds off in the Heart of God’s Own Country- Kochi! Press Release : After steering through the four corners of the country, the 20 chosen bikers of the “Yamaha SZ Tour-Stay Ahead” today reached Kochi, where the Tour culminated amidst huge fanfare and festivities. The excitement was palpable in the air with the presence of renowned singer Benny Dayal along with some other fun activities put together to welcome the riders and mark the culmination of the tour. The Yamaha SZ Tour was flagged off on the 15th of September from Yamaha’s plant at Surajpur, Uttar Pradesh. It was a month long expedition in which 20 riders (10 each from Team A and Team B) covered the length and breadth of the country across 67 cities in 17 states including Delhi, Uttar Pradesh, Rajasthan, Gujarat, Madhya Pradesh, Maharashtra, Goa, Orissa, Chhattisgarh, West Bengal, Jharkhand, Tamil Nadu, Karnataka and Andhra Pradesh. Yamaha dealers in all 67 cities had given a warm welcome to the riders of the tour. The tour also promoted Yamaha’s safe riding education program - Yamaha Safe Riding Science (YSRS) for inculcating safe riding habits and raising traffic safety awareness among local communities. Yamaha has already conducted this program in 7 cities across India since its inception a year ago. Through Yamaha SZ Tour, Yamaha also aimed to promote safety riding among bikers with the slogan “Be Safe on Road – Wear helmets while riding”. Commenting on “Yamaha SZ Tour”, Mr. Yutaka Terada, Director – Sales & Marketing, India Yamaha Motor said, “Through the YAMAHA SZ tour, we aimed to appeal & reach out to a wider section of urban and rural customers. We also wanted to demonstrate Styling and Comfortable riding of SZ models and we are pleased that Yamaha SZ has proved to be a powerful commuter that can be pushed to its extreme on the highway and within the city. The riders had a very comfortable riding experience over such a long distance on these bikes. The tour has been equally successful in creating excitement in the cities covered and in promoting safety riding among the youth.” Speaking about his experience, one of the riders, Shahab, said, “The Yamaha pan India SZ-X tour has been a memorable experience written down in our hearts forever. Having been divided into two groups - A and B; we began on our month long ride of a lifetime. The public response has been overwhelming and with all their support we have had a very good time. The distinctive and unique culture of every city and state that we visited is a wonderful experience in itself.” Ideal combination of Power, Comfort & Style, SZ has been designed with a strong focus on quality and performance. It has been designed and engineered down to the finest details for maximum comfort of the rider. Powering the new SZ is an all-new 4-Stroke air-cooled, SOHC single cylinder with 153cc engine that has been tuned for optimum performance i.e. Extra Power in the low to mid-speed range thereby ensuring a stress-free ride on Indian roads. There is a large capacity 14L fuel tank which gives the ability to go Extra Mile. The long cushioned seat ensures comfortable riding position enabling a straighter back and Extra Comfort while commuting long distances. To mark the culmination of the tour, Yamaha had also put together myriad fun activities for its customers in Kochi and those who had come to cheer the riders, including Test Rides of Yamaha bikes, Sales & Finance Options, special safety riding lessons for kids, Intercollegiate Dance fest and an eclectic performance by Benny Dayal, who has sung in movies like Delhi-6, Ghajini, Yuvraaj and Jaane Tu Ya Jaane Na. The response to the event was overwhelming as Yamaha gave an opportunity to test rides its hottest bikes in the Yamaha stable. For those on the look-out for easy finance, Yamaha offered multiple finance options at its exclusive sales & finance counter. 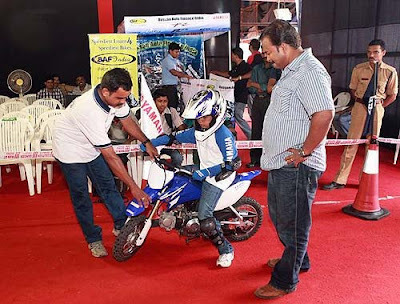 The kids had their share of fun with mini bike safety training and fun games organized exclusively for them as an extension of Yamaha’s Safety Riding Science (YSRS) initiative. Adding more fun to the event was the performance by Benny Dayal who spelled magic among the enthusiastic crowd with his mesmerizing vocals amidst international troop dance performance and left them wanting for more.